Six Feats Under is an actual play podcast, and we’ve just begun another long-running campaign! A lonesome dragon, figuring out who they are and why they even exist. A playful guardian, exploring a world they do not understand. A mysterious wizard, who cares more than they want anyone else to know. An outcast engineer, trying to find something, anything to believe in anymore. They have formed a fellowship to end an endless winter. The world does not know them, the world does not love them. But they will save it anyway. Fellowship is an RPG written by Jacob Randolph, also known as Gnome. The game follows a band of heroes from different origins uniting against an evil Overlord trying to conquer the world. Unlike most such games, each hero gets to carve out their own portion of the world, declaring truths about their people and their place in the world. The heroes work together to create the world they intend to save, getting them invested in everything, just before the Overlord strikes it all down. 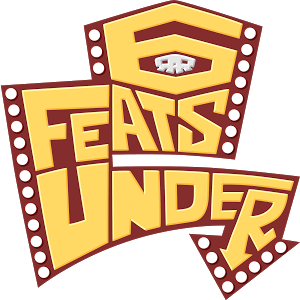 We’re Six Feats Under, an actual play podcast group specializing in tabletop games other than That One. We play a lot of one shots of various systems, known as our Bonus Feats, and we also play some longer running campaigns. Our first campaign, Let’s Play The 13th Age, took 5 years and 89 episodes. Hopefully, Mouse Guard and Fellowship: To Winter’s End will take a little less time than that. 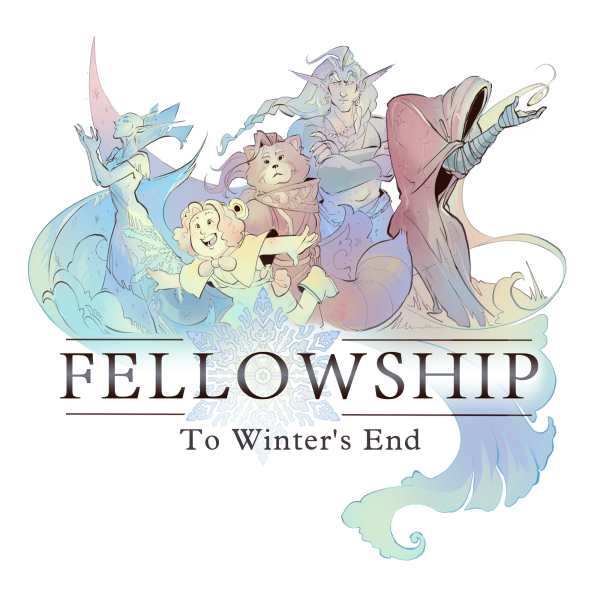 This thread is for our Fellowship campaign, our third big campaign featuring a regular cast of heroes going on a long, continuous adventure. It is running concurrently to our Mouse Guard campaign, which follows two squads of mice as they protect the Territories from danger. You can find the thread for our Mouse Guard campaign over here. Friar Pan is played by Clove. The Dragon. Friar Pan is a half-dragon, raised by dwarven nuns in an old monastery. He loves to cook, especially cakes, and Poptart is his best friend in the whole world. He is also the Engine of the Pumpkin Patch. In spite of all that, Pan feels like he’s missing something, like there’s some greater purpose out there hes just missing out on. Pan seeks Relentless Justice and The Dwarven Craft. Harbinger is played by Ikks. The Harbinger. Harbinger is a priest of the Columned City, a pillar of the High Doric Order. They are shrouded in mystery, quick to give commands, and slow to explain themselves. Harbinger is in charge of the Pumpkin Patch’s Communications. They talk big, but their motives seem benevolent. Probably. Harbinger will Fulfill The Prophecies. Poptart is played by Joey. The Halfling. Poptart is a guardian spirit, equal parts River and Frog, and Pilot of the Pumpkin Patch. They love to wrestle, ride on top of, and eat with anyone who will have them. Playful and mischievous, Poptart is mostly here because they don’t like the cold. They have no idea what’s coming. Poptart wants to Have Fun, and they have an Alien Mindset. Yuria Bloodtongue is played by Riley. The Squire. Yuria Bloodtongue is a red panda, once torn apart by Aurorealis, but put back together by O.R.C. robots. She is Captain of the Pumpkin Patch, and can call on her old O.R.C. allies for help if she needs them. In spite of all this, she feels inadequate, and is here to find some kind of belonging or purpose. Yuria knows that They Need Me. This is what dogs are. Normal Dog is the Pumpkin Patch’s Gunner, and Harbinger’s Companion. The Quadcore Pumpkin Patch is our heroes’ ship. The QCPP is a flying shopping mall, a series of storefront pods rigged together with steam pipes steel catwalks. Whimsical and complicated, it drifts through the air via a complicated system of levers, steam, and balloons. Aurorealis is played by Gnome. 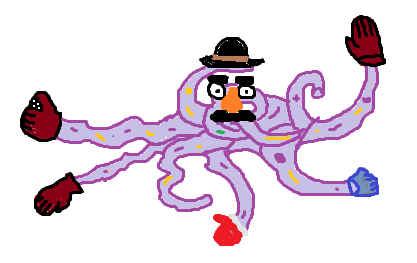 The Overlord. Aurorealis, Who Fire Forgot, is a mysterious being whose motives are entirely unknown. All we know is that they want the world cold, and they have the power to do it. She is tall, bald, and pale as the fallen snow. Episode 00: Character Creation: Meet the crew. Episode 01: A Tower Stands: This is a heist mission. Episode 02: That Buster Keaton Skit: Bring me the orb. Episode 02.5: The Pumpkin Patch Procedure: Meet the ship. Episode 03: The Jolem: Halt, please step back. Episode 04: Flapjack: We need to protect this place. I don’t know what that means yet. Episode 05: A City Under Siege: I could make you better. Episode 06: B0-L4: Here’s your big shot, hero. Episode 07: The Truth or A Lie? : We were never normal. Episode 08: World Building: Meet the world. Episode 09: What Does A King Do? : They build big things, to show how big they are. Episode 10: Revolution: What does your soul look like? Episode 11: Fair’s Fair: Let’s promise to kill each other. Episode 12: Wanted Posters: Halflings are illegal now. Episode 13: Finding Trouble: Today is a day of revelations. Episode 14: Panhandling: Oh sure, who hasn’t touched an orb in their day? We’ve all been there. Episode 15: B1-l1 “Billy”: Can’t we just have a night out on the town? Episode 16: The Second Tower: Who are you to decide what is right or wrong? Episode 17: Smashing Pumpkins: We brought this upon ourselves. Episode 18: Yuria Bloodtongue: About an hour later, your heart starts beating again. Episode 19: Poptart: What do you see value in? Episode 20: Harbinger: You’re dead. Congratulations! Episode 21: Friar Pan: Why not subject yourself to grievous violations of your bodily privacy for the sake of science, and nihilistic curiosity? Episode 22: The Columned City: We can build another ship, we can build another home, but we need to find our family. Episode 23: X3-N0: I haven’t seen my children in so long. Episode 24: The Flesh God: It is a single creature, but also an entire ecosystem by itself. Episode 25: Rue Titania: Wait, it talks? Episode 26: The Secret Library: What do you know about magic? Episode 27: Columnist Brawl: How do we convince you to betray your god? Actual Play and discussion podcast featuring diverse and interesting people playing diverse and interesting games. Can we truly reclaim what we've lost? 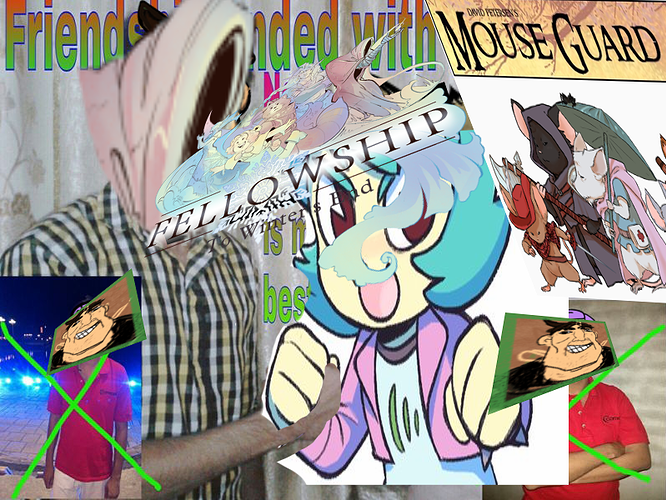 Let's Play Fellowship! I feel it’s appropriate to answer some vital questions regarding this campaign, starting with the most important one: Who vapes. And we have a solid answer: Yuria. 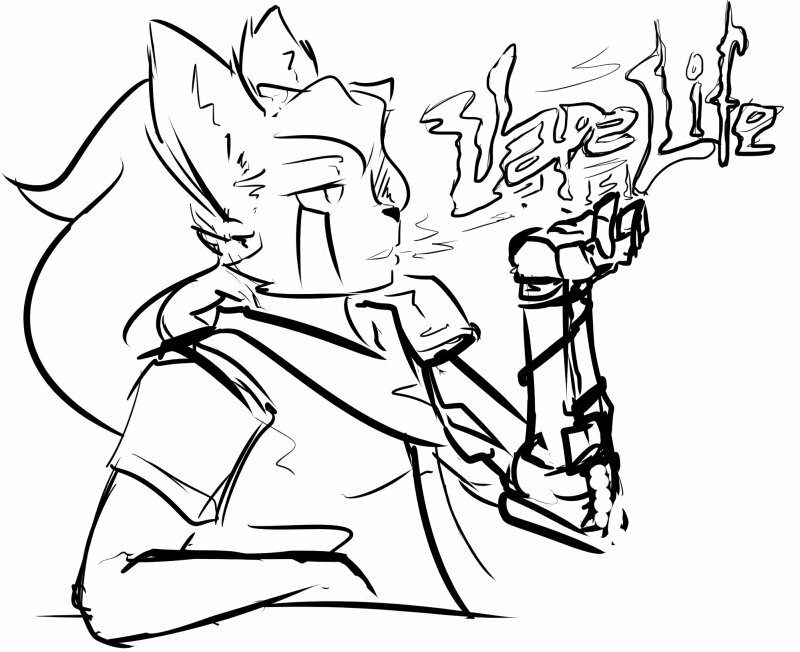 And for a bonus: She’s doing HRT through vaping. That should give a good clue what kind of scrap engineer she is. I’m rooting for Aurorealis. Boris must be avenged. This is an extremely cute group of adventurers. I’m interested how this plays out as a full campaign after the one shot the show did, like, a year ago. So we talked about The Spider a bit in the episode, and I said specifically that it was not going to be out by the time the episode went up. And I was right, but only by a single day. The Spider is now available for purchase. So if you think this game is cool and want more things for it, here you go - the newest expansion! Poptart’s running with a Spider move, Agenda, and some Gear that were added in this expansion, so if you want to be like Poptart, you’ll want to pick this one up. Can’t wait to see where this goes! All of the characters sound really cool, and I’m interested to see how this RPG plays as the game goes on. Hi I posted this on twitter but more of the world needs to know that just the character creation of this good podcast inspired me to commit “Art”. This campaign is going to be glorious, I can tell. Looking forward to the first proper episode! The fellowship begins its first daring heist: to topple a weather control tower on top of the Blue Mountain, deep in Aurorealis’ territory. Guarded by a city of pandas, a snow golem, and a pair of powerful, definitely named antagonists, our heroes have their work cut out for them. Friar Pan is played by Clove. Harbinger is played by Ikks. Poptart is played by Joey. Yuria is played by Riley. Aurorealis is played by Gnome. This episode was edited by Gnome. Episode art is by Clove. All music in this episode was performed by Thylacinus. The introduction was an excerpt from Kingdom, by VNV Nation, and voiced by Grant. I gotta say, I do enjoy how completely dysfunctional everyone in the group is. Nobody quite gets how everyone else operates and those that do don’t particularly care and it’s causing more problems than it solves and it’s great. I’m looking forward to the next episode is what I’m saying here. I saw the episode get downloaded on my podcatcher - This looks like an interesting EPIC series especially compared with the more down to earth mouse guard series. (You need both.) I am hoping to fall in love with the characters once I listen to them. Edit: I am halfway through the character creation - I REALLY love Poptart and Pan. I have listened to all of this now - Is this chaotic almost sketch like nature a part of the system in general or is it done in the editing and Starting it in-media-res also a part of that? and I still really love Poptart and Pan. That is how the system works in general. You hop from player to player, never letting the camera sit on anybody for too long (which I think I didn’t do perfectly this session - a bit too much camera on Pan and not enough on Yuria, but it gets better in future sessions). Editing amplifies this a little bit, though, since I like to keep the podcast flowing quickly. But that is very much a part of how Fellowship’s system is set up to work. The weather control tower has fallen, our heroes have completed their mission. 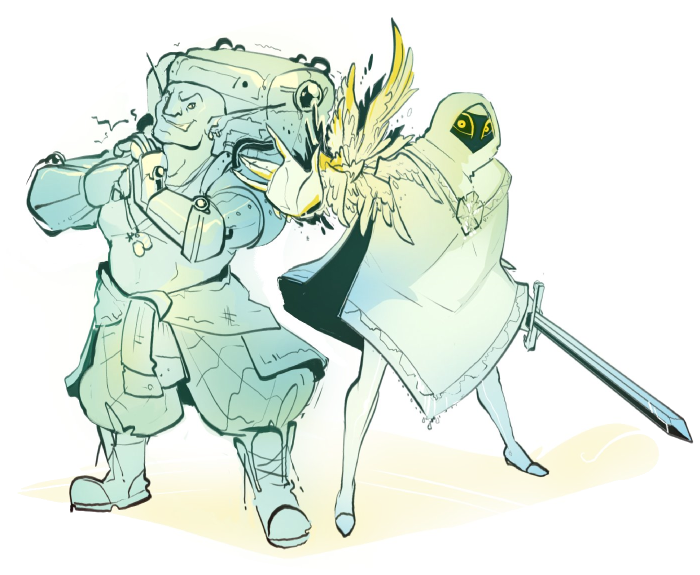 But their enemies, Knight and Ggislin Ketos, are still here, and still ready to rumble. Can Pan, Poptart, Yuria, and Harbinger manage to escape, when they can’t even manage to agree with each other on anything? This episode was edited by Gnome. Episode art is by Clove. Most music in this episode was performed by Thylacinus. Ice Ghost was performed by Possibly. The introduction was an excerpt from Kill V Maim, by Grimes, and voiced by Grant. This episode really helped with Yuria doing stuff. I really want to know what O. R. C.s look like. At some point I need to draw Vire at least, we do have a bit of foundation for them since I originally was going to play Orc when we started planning. Welcome to our second character creation episode! This week, we build the biggest character in the crew: The Pumpkin Patch, the massive flying shopping mall that we all live in. Here is a list of every shop in the ship, including the ones that didn’t make it. This episode was edited by Gnome. The music in this episode was performed by Thylacinus. The introduction was an excerpt from Castles in the Sky, by DJ Satomi, and voiced by Grant. And lastly, we are doing a Patreon drive right now! I’ll only clutter the thread with this once, but you can find our Patreon here. If you like the show, and you want to hear more, please consider donating, if you haven’t already. 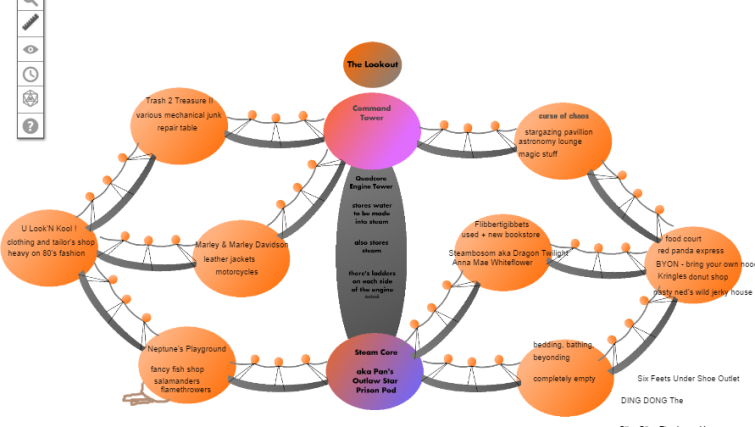 We’ve completely overhauled the reward tiers and our patreon goals, so give it a look! I really loved listening to the Pumpkin Patch being built. it was fun piece of character creation. Fellowship has been nominated for an Indie Groudbreaker award in the Best Art category. Two of the artists in the book are in this campaign, so I’d like to offer a special congratulations to Clove, Ikks, and all the rest.